We are still struggling with our smoking habit. Currently the weather has been kind to us, so smoking outside isn’t such a huge deal at this moment, but any week now it is going to change and we will be forced to have a cigarette in the pouring rain outside the front of the house. We just want to stop smoking. I am very open to any and all new products out there, in the hope that something will help us quit. When I heard about NicoBloc I obviously wanted to try it out. NicoBloc is a coloured fluid that you apply to the filter of the cigarette immediately before smoking. Typically you use the product over a six-week period to prepare you to quit smoking by reducing gradually your nicotine intake to allow your body to adjust gently to physical changes that occur during the drug withdrawal. Whilst other systems help overcome the withdrawal syndrome once you have stopped smoking, NicoBloc prepares you physically and mentally and helps you before you break the habit completely. The NicoBloc solution is not taken orally but is put on the filter of the cigarette without significantly changing its taste. Because of this, it does not have any counter-indications or interfere with any medication, so it can be used by anyone, including pregnant women. You keep smoking but slowly reduce your tobacco consumption until you stop entirely. There are no withdrawal symptoms, as NicoBloc helps your body adapt gradually to the reduction of nicotine levels at the same time as the number of cigarettes smoked is also being reduced. 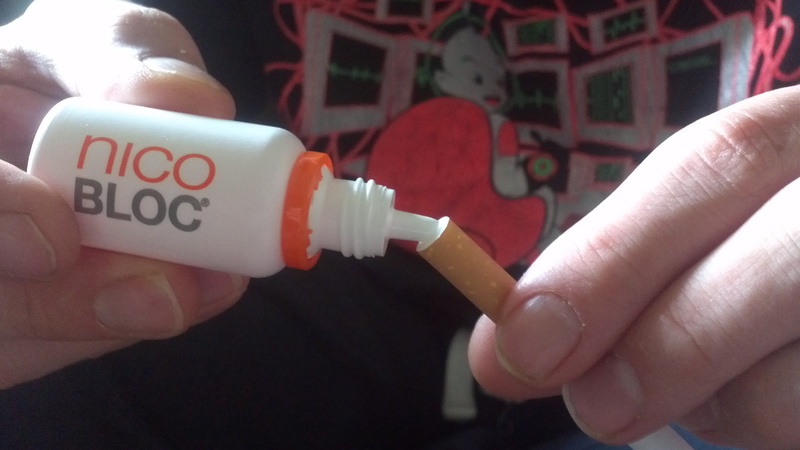 The NicoBloc solution is not ingested; you apply it to the cigarette filter. NicoBloc blocks the ingestion of nicotine and harmful tar, which causes cancer, by up to 99%. It does not have any counter-indications or produce undesired effects. So what do you receive once you order your NicoBloc? When applying more than one drop at a time, you should follow the steps described one by one. That is to say, you should not apply all the drops without following the 4 steps below. Make a deep indentation into the cigarette filter with the bottle nozzle. Squeeze the correct amount of NicoBloc fluid into the filter immediately before you smoke it. Follow the complete application process 2 or 3 times as required, applying one drop each time, rather than applying double or treble size drops. Allow each drop to soak in before applying the next drop. Use the nozzle to spread the fluid, so that it covers the total filter surface. Squeeze the filter a few times; this helps it to absorb the fluid. Light the cigarette and immediately take a strong first draw, before smoking the cigarette as normal. The NicoBloc solution should be applied to the filter immediately prior to smoking. It should not be applied to all the cigarettes in the pack at the same time. The solution remains active for about 5 minutes after being applied. Thereafter, it dries out and becomes ineffective. How much of NicoBloc should you apply? One NicoBloc Drop – 33% Nicotine and Tar is blocked – reducing the addiction to Nicotine and the harmful effects of tar. Two NicoBloc Drops – 66% Nicotine and Tar is blocked – further reducing the addiction to cigarettes. 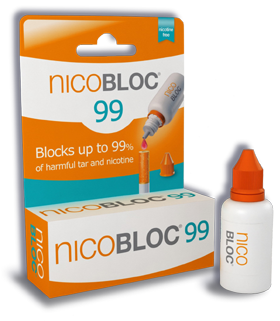 Three NicoBloc Drops – 99% Nicotine and Tar normally consumed is blocked and by this stage the consumer trials prove that 60% of users have given up smoking. I think it actually does work. After 3 weeks of using it I don’t crave cigarettes so much and I definitely smoke less. I am still on only 1 drop each cigarette, as I chose to take it easy and reduce the amount once I feel more confident I can deal with it. NicoBloc doesn’t change the taste of your cigarette at all in fact I am sure if someone would pass you an already made and lit cigarette, you wouldn’t even know the difference. The only downside is that I have to prepare each and every cigarette straight before I want to smoke it. This isn’t always possible for example on a long drive I would roll a few cigarettes before setting off here I cannot take advantage of the NicoBloc liquid… so I have to try and use NicoBloc as often as I can. I am not sure if this would be a good idea from a business perspective as the cost of packaging would go up exponentially but what about selling them in single doses of NicoBloc in some form of one use delivery system? It might be more convenient and quicker to use and would always ensure the correct dose. I mention this because it can sometimes be difficult from the chunky bottle supplied to get just a single drop. If in a rush or multitasking in this modern hectic lifestyle it is all too easy to overdo it. If you are struggling to quit smoking and you are determined to succeed I think NicoBloc might be just what you are looking for. Yes, it does require some “work” but it also gives visible results in a fairly short amount of time. If you decide to take this road, stick with it and good luck! * Product was provided by NicoBloc via Bloggers Required free of charge for review purposes. The opinions expressed in this review are honest and my own . because of my seizures how safe would this be fore me. Hi Grace, if you have health problems I would recommend contacting NicoBloc directly… just to be on a safe side. For all those looking to stop smoking. Google: Easy Way to Stop Smoking by Allan Carr. No patches or gums or anything. It’s a book. About 140 pages. My husband quit once after reading it. Without any real issue, and smoked a pack a day. sounds crazy but it works. Give it a try. Can’t lose anything by reading… besides kicking the habit! Unfortunately it seems to have a one time effect for my husband (so be 100% sure you’re ready to kick it before reading!) unfortunately he started again after a big stress in life. And hasn’t been able to stop again, hopefully Nicobloc will be the next miracle he needs. I am not sure to be honest. All I can recommend is to contact manufacturer directly. You can order directly from nicobloc.com or Amazon. Yay, well done! Now just keep it up and hopefully soon you will be smoke free. HI Dave, so glad you are feeling well, however I do need to tell you that you will feel EVEN BETTER if you follow the NICOBLOC protocol and start your withdrawal using only ONE drop for the first week or two, and advancing to TWO drops after that for a week or two, etc until you are ready for THREE drops. The objective being that you will have ZERO change in taste or satisfaction in this regard, as well as ZERO cravings or side effects. Please email or call me anytime, with any questions or support required. Best Regards, Rhonda P.S. Where did you buy your NB product? I’m glad to hear it’s working for you. I really want to try it but I have some concerns. It says the drop is only effective for 5 mins. but it takes me more than 5 mins. to smoke a cigarette (I guess I don’t take strong drawls). I smoke 120 ml. cigs because I can smoke 1/2 & put it out and smoke the other half later. If I use 1 drop for 1st use, put it out, then re-light later using another drop, will the 1st clog up the filter after it has dried? Don’t suggest I smoke a shorter cigarette because I chose the longer ones because half is just enough & allows me to get 2 smokes from 1 cig., save some money. Did you get a reply to this? I do exactly the same thing. I thought about maybe we could cut the tip of the filter off for the second half of the cigarette. Maybe use one drop. I just ordered the stuff but haven’t started it yet – now I’m having second thoughts because like you, I’m also trying to save money. Rhonda Shuter here in Canada. I will send your question directly to the Science Director at NicoBloc and we can all benefit from his reply! Thank you to everyone out there for all your great comments, and appreciation. I promise you all one thing. NO matter how you try, you will be doing yourselves a huge amount of HARM REDUCTION by using NICOBLOC. Great job, and Congratulations to you all! We will soon be on the shelves all over Canada too, and we welcome all new Ambassadors to our circle! Best Regards, Rhonda. HI Bill, so happy you are upset! :)) Love your comment! The problem with our Canadian pharmacies is they don’t know much about health, but they know everything about medication! London drugs sells it as well Bill. It’s on sale right now for $21.99 in AB. Can this be bought over the counter…if so where? I never heard of this before and I think it’s great. I hope you find success with NicoBloc! I wish you the best in quitting smoking! 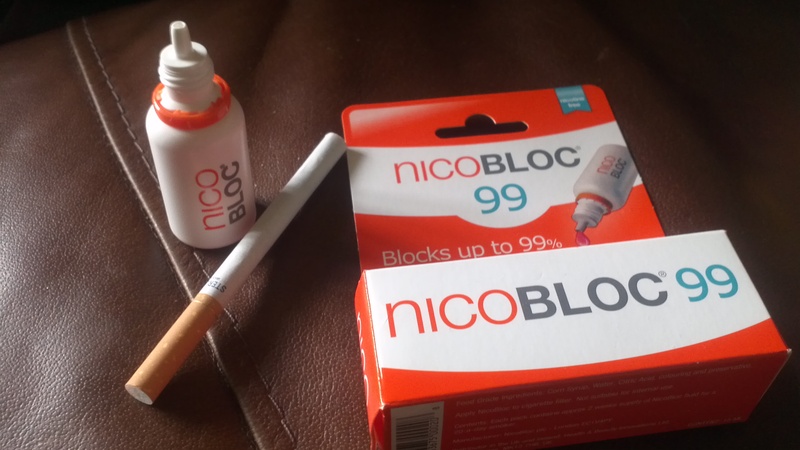 Good Review.. I’d love to give it a try 😉 though I’m not a smoker..
NicoBloc 99 sounds like a good product; I wish you all the best! Maybe a little off topic, however, Quit smoking as easily as attainable. By no means attempt to go cold turkey. If you try to quit smoking right away, you will find a 95% likelihood that you will fall short. Nicotine is exceptionally addictive, so use a patch, remedy or medication. This will enable you to get as a result of the early levels of withdrawal, and will make it less difficult to quit smoking cigarettes. If you are on the lookout for a chemical help to give up smoking cigarettes, then be extremely thorough about this solution. Medicines this sort of as Chantix have a somewhat weak achievements amount and can have the opportunity to trigger critical hurt to your system. It performs by altering your mind chemistry, and can guide to extreme melancholy and suicidal tendencies. If you’re hoping to give up smoking cigarettes, try quitting chilly turkey. This system is the least complicated in the prolonged operate. While this may possibly seem to be a large amount far more hard when you are setting up out, it is significantly simpler than stringing your self along. Be sincere with your self and dedicate to the stop and you will be off cigarettes rather conveniently. If you are striving to stop smoking all alongside one another then you want to dedicate and stop carrying your cigarettes around with you. If you do not have cigarettes with you then you make it significantly less handy to smoke. This will make it a lot easier for you to give up in the very long operate. Help the signs or symptoms of nicotine withdrawal. If you come to a decision not to use a item that incorporates nicotine, these kinds of as a patch, gum or lozenges, feel about inquiring your health practitioner about a prescription treatment. Specific supplements can assist to lower cravings by affecting the chemical substances that your brain creates, lessening the signs and symptoms. There are also specified drugs that will make a cigarette taste horrible if you come to a decision to smoke. Remember that your mindset is all the things. When you are starting to really feel down, you need to have to consider to make on your own proud that you are quitting. Smoking cigarettes is bad for you and every single time you conquer the urge to smoke, you must truly feel happy as you are taking essential ways towards a healthier you. Good luck! I’m sure it’ll be a positive life change! I hope you will stick with your efforts to stop smoking! My mom smoked from ages 14-30 and finally kicked the habit when she got pregnant with me. Don’t get discouraged if cigarettes are still appealing to you; she says that if smoking wasn’t so terrible for her health, she would totally still do it because she honestly loved the taste when she was a smoker! Every time she gets an urge, she just reminds herself of all she has to live for. 🙂 Best of luck to you! This seems like a great product! Crossing my fingers that you´ll quit smoking 🙂 Think it´s worth it. Interesting product! This is my first time hearing about NicoBloc, and it sounds like a cool concept to help during the quitting process. I guess it may work for some people, I have not found it to be a great help to anyone! ALSO, one of very main ingredients is citric acid! ANYONE with acid reflux or hiatal hernia should NOT use this product. I did not know this and ended up really hurting myself. I was not on daily medicine for my acid reflux before, but I am definitely on it now after using this stuff. People with this problem, be wary and careful! This is very interesting! Great review! Wow! That’s interesting. I’m trying to think of people I know that smoke and are trying to quit to send them your post. Definitely a new way! I am trying to quit smoking black and milds. I wonder if this would work for them?